During World War II, the Royal Air Force had its own bomb disposal squads (similar to the better-known Army BD squads). These RAF bomb disposal squads had a dangerous job that few would envy. 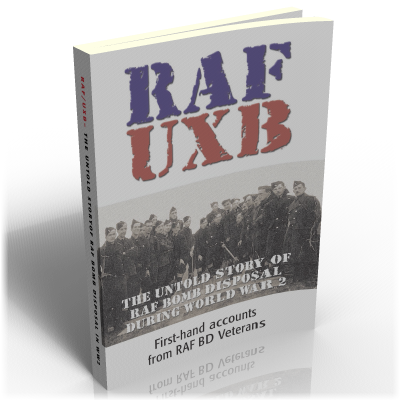 This collection of first-hand accounts gathered from RAF Bomb Disposal veterans gives an insight into their activities, which included rendering safe all manner of explosive devices, often in very challenging conditions. Without their invaluable efforts in clearing enemy bombs from RAF airfields during the Battle of Britain, the Hurricanes and Spitfires of Fighter Command would have been unable to fly. They were also involved in the hazardous work of retrieving bombs from Allied aircraft that had crashed in the UK and later, after the D-Day invasion, they had to deal with the deadly booby traps left behind by retreating German forces as well as defuzing the thousands of unexploded Allied bombs dropped on foreign soil. Despite the modesty with which they tell their remarkable stories, the bravery and endurance exhibited by this hardy band of unsung heroes is both humbling and inspiring.